I am not a great speller, I am not even a good speller, but I love to read. 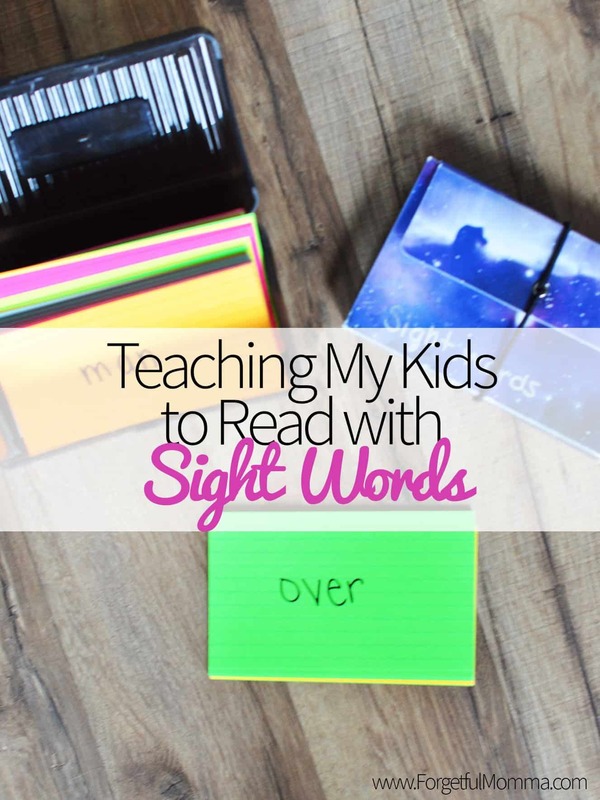 I am currently teaching my kids to read with sight words, starting with some great books that use this same idea, and with books that we already love. I do not rely just on sight word and flashcards of course, we also use phonics. This started back when Austin was in Kindergarten (public school), the class was only learning about half of the letter sounds – that was the requirement set by the education board (as I was told by her teacher when I questioned it). Knowing she already knew her letter sounds we started working on small words on index cards. Simple words such as: and, the, she, etc. We practiced them on and off, not forcing her. We also have some great flashcards that came with some curriculum I purchased. Memorization can be very difficult for young children, but without it, reading frustration levels will be much higher. Their confidence as a reader grows first by reading a full sentence and then a whole page without having to stop and search for context clues to read the sight/high frequency word. Some of the great books we love are the Phonics Step into Reading Books boxed sets. We have Paw Patrol, Berenstain Bears, and Pinkalicious. They are simple to read, just a sentence per page, nothing to overwhelm. These books have lists of words printed on the first page for your child to practice and which they will see throughout the book. As she has moved through the sight words, she has become much more confident in her ability to read. After 2 years of her claiming to be unable to read and hating the idea of it, Austin in formed me that she loves reading now, in fact she is reading chapter books without any prompting from me. We’re repeating this process with Brookland and will again when Gauge is ready to learn to read. After a recommendation from a family member I bought 100 Days to Teach Your Child to Read, but we honestly haven’t used it yet. My kids have been learning to read from being read to, and from sight words and flashcards. I think phonics is important, but we have two struggling and reluctant readers and when I switched from heavy phonics to a more whole-language approach, it really clicked with them. I would still recommend phonics for most kiddos (and use it with our other son) but for some children, sight words come easier. We also like Step Into Reading because the graphics engage my reluctant readers better than pages and pages of nothing but words.